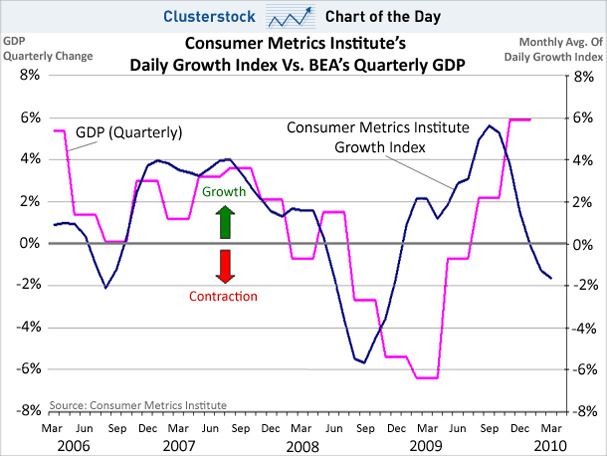 The advantage of the institute’s method is that consumer transactions data might be able to indicate the direction of the economy before U.S. GDP data is officially released. 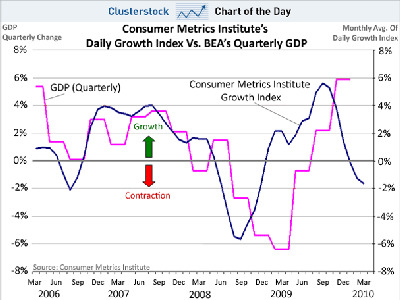 As shown below, their ‘Daily Growth Index’ has lead changes in U.S. GDP reasonably well, at least going back to 2006. Admittedly, this is a short time frame. That’s because their Daily Growth Index just crashed, which means that U.S. GDP growth could be about to slump as well. Still, keep in mind that many economists expect about 3% U.S. GDP growth in 2010, so it wouldn’t be a huge surprise if U.S. GDP growth slumped a little bit in the coming quarters.